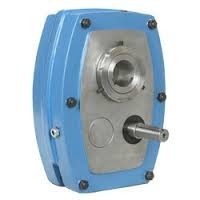 We are offering Shaft Mounted Speed Reducer. The availability is in six sizes (a to f) with nominal ratios of 5:1, 13:1, & 20:1. The gears are helical and are manufactured in case carburizing alloy steels with a hard wear layer and a softer core so as to resist shock loads. The Shaft Mounted Speed Reducer Gearbox are facilitated with metallic double lip oil seals. These help blocking out the dirt from the outside. All gear units are tested for gear crack, noise, and leaks for a trouble free operation. The gear units have an advanced tooth design to give higher power to weight ratio for the same size gear box. Advantage of modifications to specific customer specification, ratios, configurations and width of gear units. Looking for Industrial Gearbox ?